I spent this past weekend in Paris with Zach. When we first got there, we decided to just walk around and see where we end up. With our good luck, this stray walk dropped us right into the Eiffel tower. It was so cool to see it for the first time. It was so breathtaking. It is such an icon that I have heard about and seen pictures, but seeing it in person was something else. We went back on our last night at sunset and went all the way to the top. It was cold but well worth it. 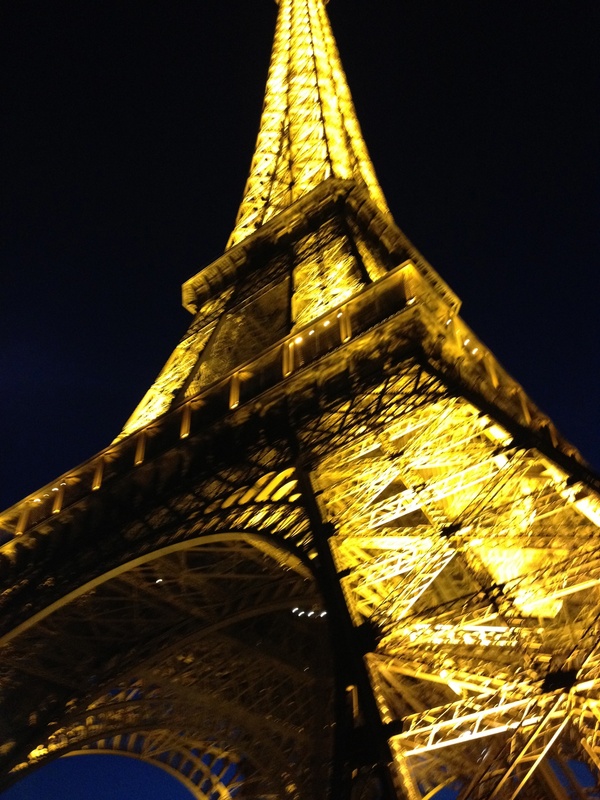 You have to go to the top when you go to Paris. The view was incredible. Paris really is so beautiful, so seeing it from the top was amazing. The next day we got a really early start and went straight to the Louvre. Seeing the pyramid in person was another cool sight. We saw the Da Vinci’s Mona Lisa, which was so small and overrated. I thought it was stupid that people make such a fuss about it. After the Louvre, we went to the Notre Dame Cathedral. It was beautiful. One of the most amazing churches I have seen abroad. I lit two candles for my dad. After that, we ran into the love lock bridge. We bought a lock from a guy selling it and wrote our names on it. We then headed over to the Luxembourg garden. It was so beautiful and relaxing. We just sat in chairs and laid in the sun. After that, we went to a cafe and got a bite to eat and some wine. We went back and chilled at the hotel and then went to this restaurant that everyone tells me to go to. They serve you wine out of baby bottles and it is cheese fonude. The concept was cool and interesting but it was kind of gross. It was a hole in the wall with graffiti splashed all over the walls. The next day we took a boat cruise which was a great way to see all of the sights. After that, we walked on over to the Champs Elysees and Arc de Triomph. The Arc was huge!! The Champs Elysees was a really cool street. It was more down scale than I thought it would be. The Abercrombie and Fitch was so nice and there was a line to get into it! We went to a really good dinner that night and hate cheese, wine and creps. We felt very french. The next day we just explored the city and went cafe hopping. I loved Paris and could definitely see myself living there. I loved the vibes. Everyone was so laid back and just chilled at cafes all day long.